THE SUNSET LIMITED is a philosophical drama based upon the stage-play by Cormac McCarthy (THE ROAD, NO COUNTRY FOR OLD MEN). As both stage-play and film, it is rather an odd fish - dispensing with the conventional requirements of plot and character development for a straightforward dialogue between two characters, "Black" and "White". Tommy Lee Jones (who also directs) plays "White", a dessicated college professor and atheist who wants desperately to commit suicide. Samuel L Jackson plays "Black", an intelligent but poorly educated former convict and Christian convert, who stopped "White" killing himself before the movie begins. The movie is, then, simply a debate between these two men, the atheist and the believer. Both are articulate, passionate and sympathetic and the stakes are the very highest. Thankfully, we are spared any pat answers. Why is the film worth watching? Why wouldn't you just read the stage-play? Given the suitably restrained direction, photography and score, the real answer is for the brilliant central performances by Tommy Lee Jones and Samuel L. Jackson. Jones has, I think, the easier task, as the clever man, convinced he is right, and essentially unchanged by his experience. Jackson, on the other hand, has to portray a man whose faith is challenged by a brilliant defence of nihilism - by a superficial failure - and yet emerge triumphant. 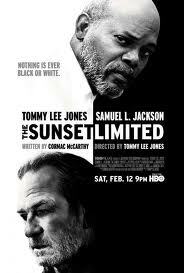 THE SUNSET LIMITED was released in the US in February 2011 and in Spain in April. It is available to rent and own.